Generally speaking, mornings are too hectic for me to make a nice big breakfast. But, I love breakfast food. So, every so often, we do breakfast for dinner when there’s more time to spend preparing and enjoying the meal. This could certainly work as a nice, leisurely weekend breakfast or brunch, as well, but there’s something fun and a little special about doing breakfast for dinner and it’s a fun way to mix things up with little eaters, as well. 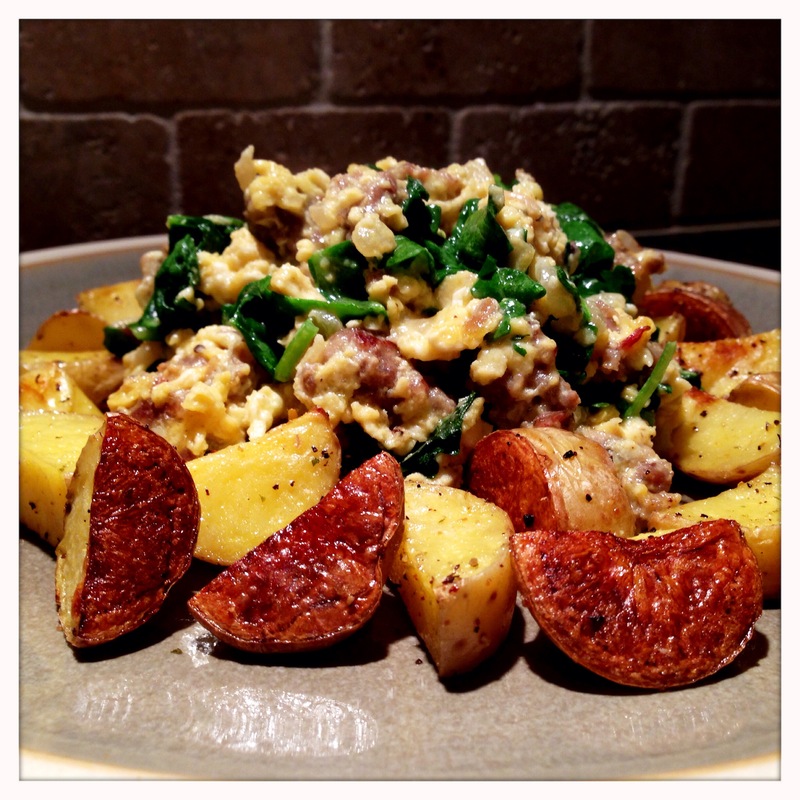 For this post, I made a sausage and mushroom scramble with baby greens and cheese and served it with roasted baby golden potatoes. This isn’t exactly a groundbreaking concept coming out of the Eats For All Ages kitchen, but a few little touches like the crispy roasted potatoes and the baby greens really elevate a simple dish to a more impressive presentation. So, let’s scramble some eggs! The longest part of this recipe is the potatoes, so we’ll start with them. Everything else can be prepped and cooked while the potatoes are roasting. Preheat your oven to 425 degrees. Wash the potatoes under cold water, and quarter them. You want roughly similar sized pieces, so you may need to cut some of the larger potatoes into sixths. Place the cut potatoes into a zip top bag with a little olive oil and shake to evenly coat. 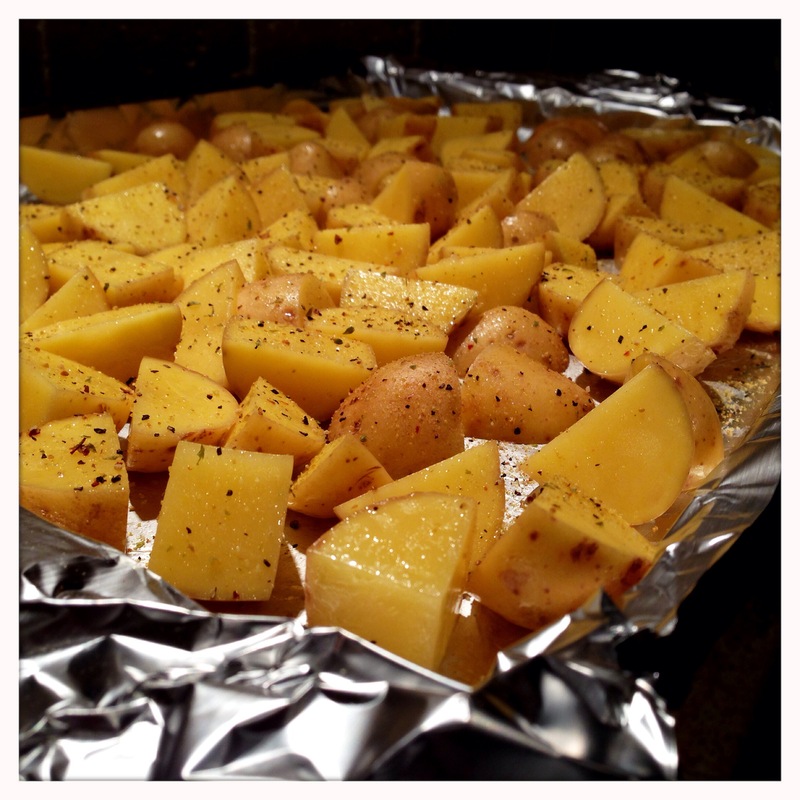 Spread the potatoes on a foil lined baking sheet and season liberally with salt and pepper. Place the potatoes in the oven, and roast for about 25 minutes. Start checking on them every few minute after about 20 minutes, but they are typically done between 25 and 30 minutes based on the size of the potatoes and temperature variance of different ovens. While the potatoes are roasting, turn your attention to the sausage. 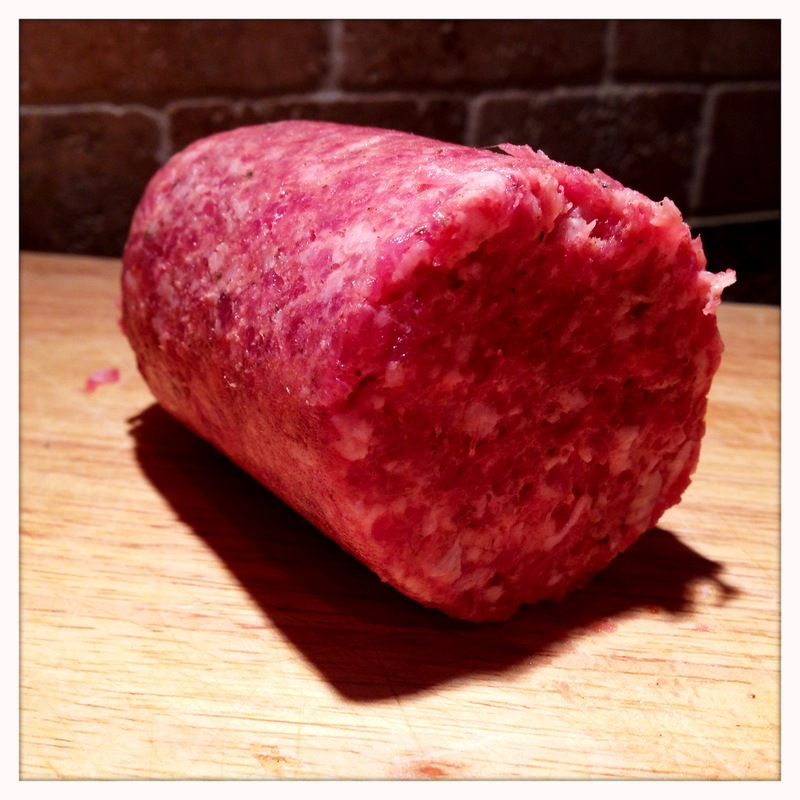 You can by the pre-cooked sausage crumbles, which I have done on many occasions, but they really are no substitute for real, fresh sausage. 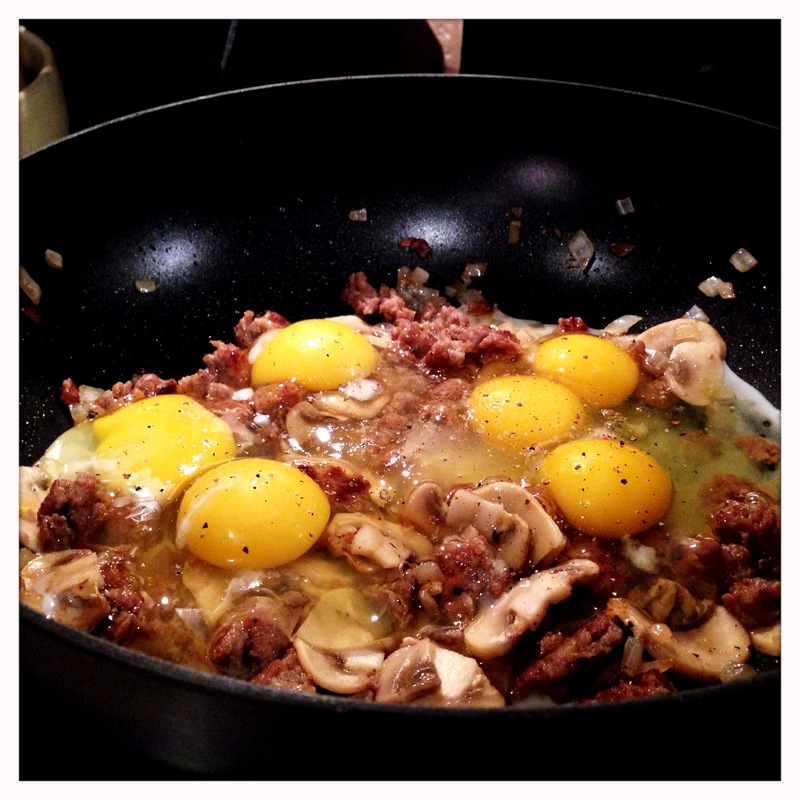 The sausage oils will stay in the pan and cook into the mushrooms and the eggs, which is flavor you can’t obtain using pre-cooked sausage. 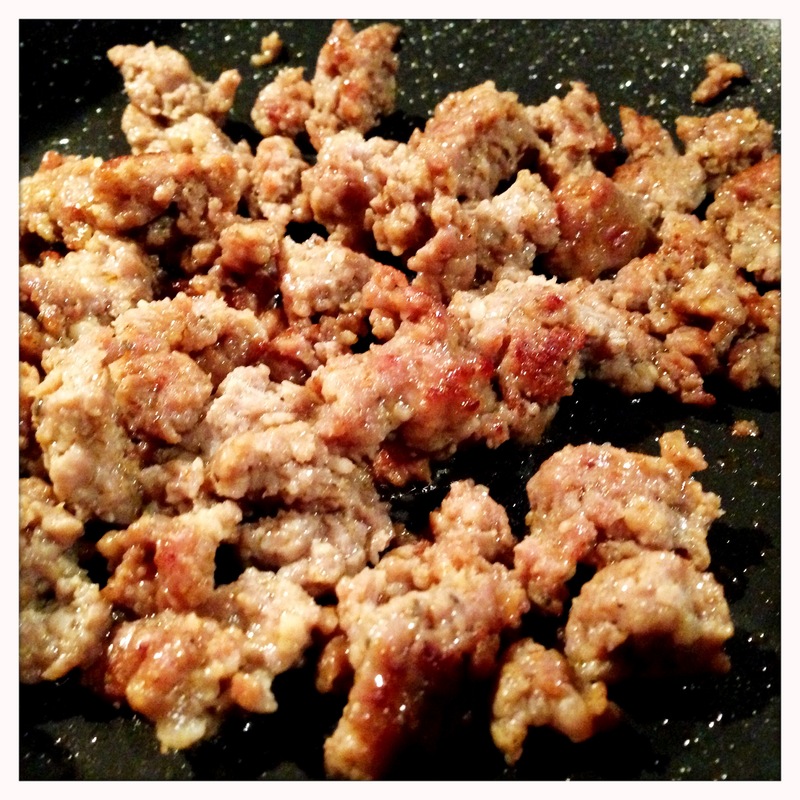 Once the sausage has started to brown, add the onions and continue cooking until they soften. 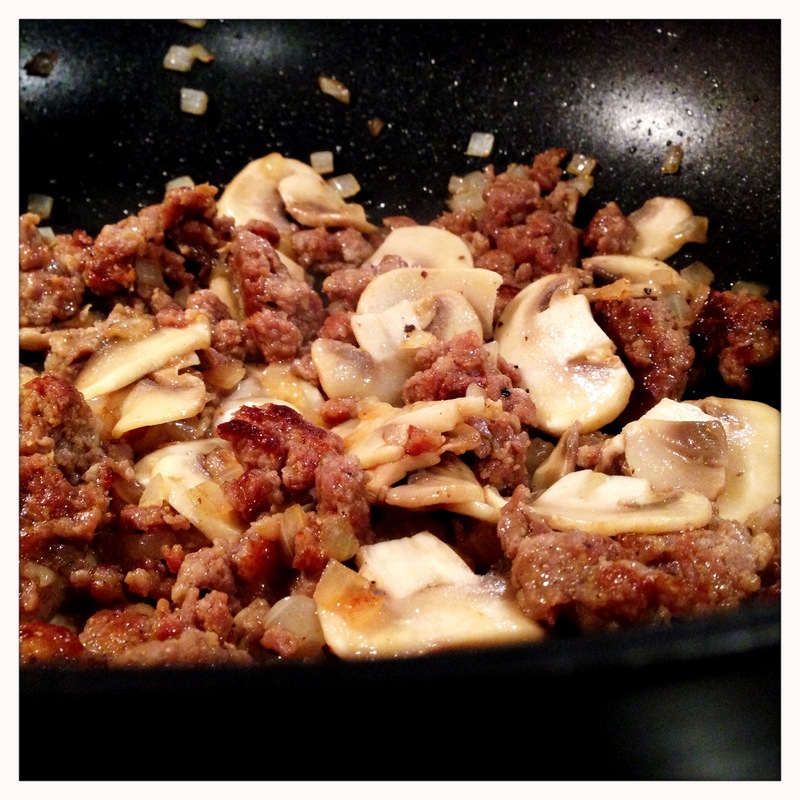 Then add the mushrooms. Using thinly sliced mushrooms will allow them to cook faster, typically in just a few minutes. 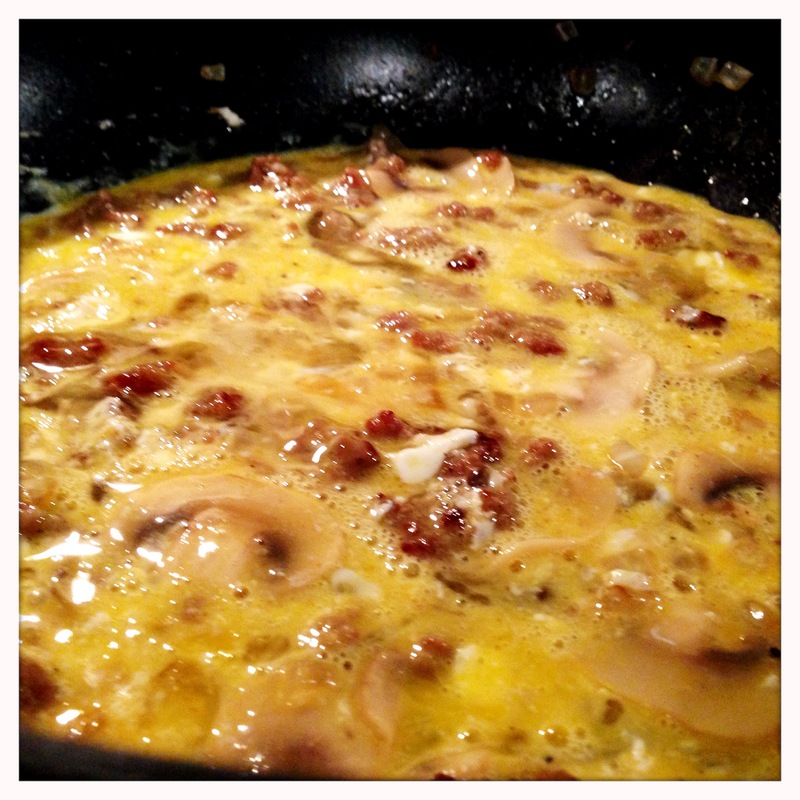 Once the mushrooms are soft, add the eggs. I do not add milk to my eggs, and I do not whisk my eggs before scrambling. Add them to the pan whole and scramble them in the pan with a spoon or a spatula. Keeping a little separation of the white and the yolk adds texture and makes the eggs more visually appealing. Keep turning the eggs gently with your spoon or spatula to evenly cook them. Once the eggs are no longer runny, add some shredded cheese and stir gently to let the cheese melt into the eggs. 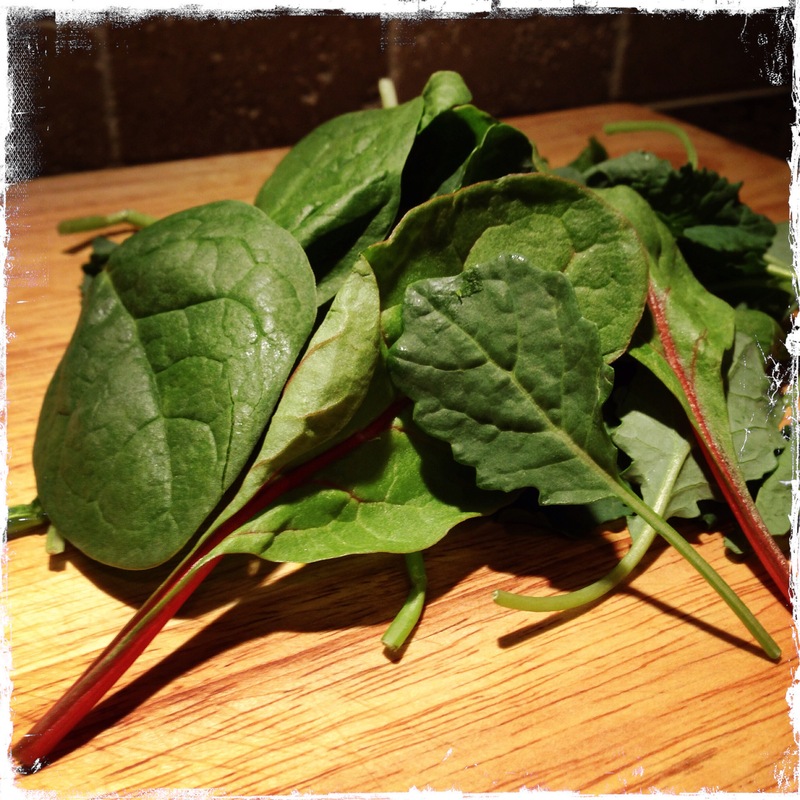 Just before serving, add the baby greens and gently combine so they wilt, but don’t let them become too soft. Once the greens have wilted, serve immediately while they maintain some of their texture. 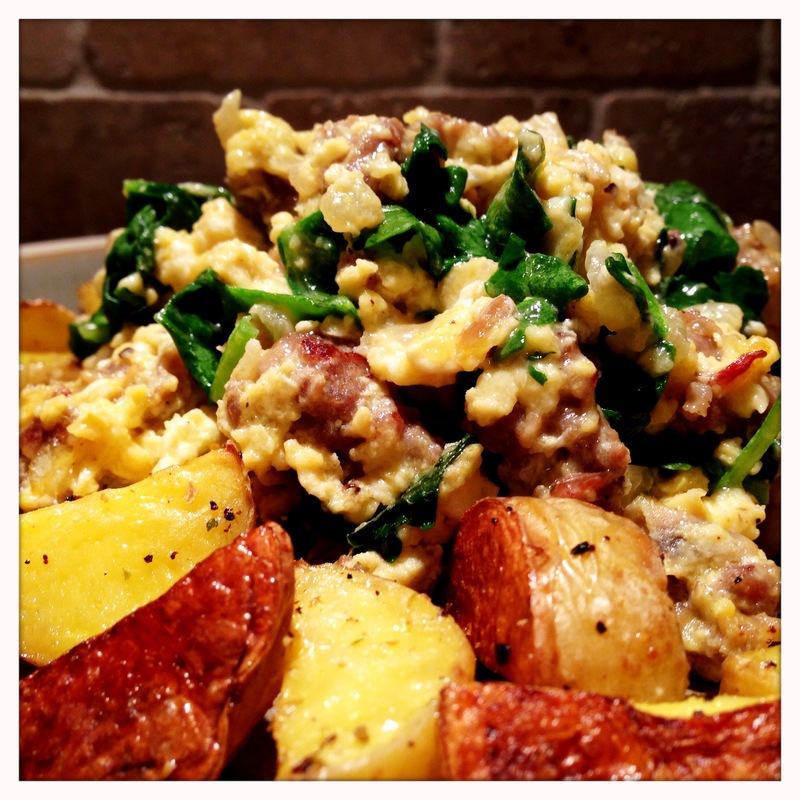 You can serve the scramble next to your potatoes or on top of the potatoes. Or, for a more impressive presentation for a special meal (or just to impress your family), serve the scramble heaped into the center of the plate surrounded by a ring of golden, crispy potatoes. Don’t let time of day dictate what you eat – breakfast foods are just as delicious in the evening as they are in the morning. Enjoy!